The weather forecast was for warm and humid as I made the drive from Monroe to Newburgh to meet Bob Harris, who would drop his car there and ride with me to the Under Mountain Rd trail head in Copake, NY to begin our day’s traverse of two New York county high points. At 2,110 feet in elevation, the southwest shoulder of Alander Mountain would be our first county high peak summit. But to get there from the trail head would require some heavy lifting. We began on the red-blazed Robert Brook Trail, a steep climb through a sensational ravine that would, within about a mile, take us to the Massachusetts border. 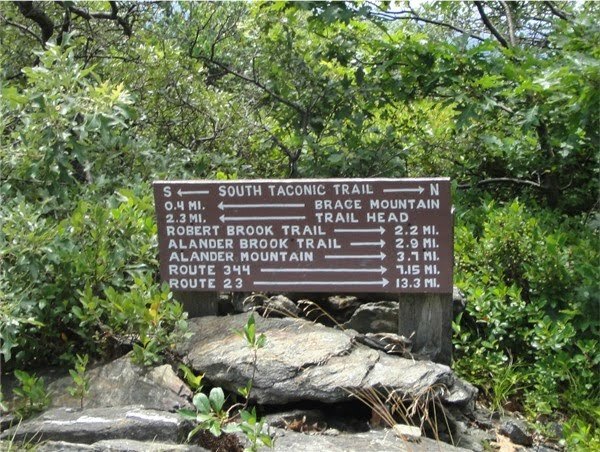 Due to the steep pitch of this trail, we had to take a couple of breaks before reaching the terminus, the junction of the South Taconic Trail. Turning left here, the trail became a very manageable woods road, and as we went downhill (not up), I remarked to Bob that this was elevation loss that we’d have to make up for on the way up to Alander’s summit. Before long, we reached a junction with an unmaintained, blue-blazed trail that appeared on our map to avoid further elevation loss, so we followed it. Upon our reconnecting with the South Taconic Trail, we spied a cabin perched high up on the mountain. How this cabin was built here is a mystery to me, but apparently it is a popular spot for hikers to spend the night, and it appeared to us that it might even be occupied at the moment. 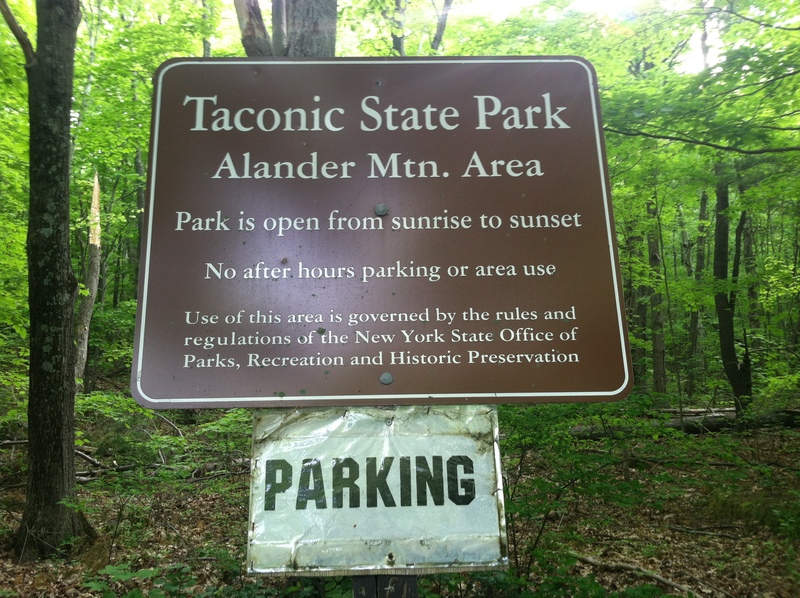 We continued upward, now on the white-blazed South Taconic Trail, and almost to the summit of Alander Mountain, which is Massachusetts’s most southwesterly mountain peak. The views from there were terrific, affording us vistas of the Harlem Valley to our west and northwest, and the continuation of the Taconic range to our south. Moving along, we came upon the location of an old fire tower (only its footings remained), and then finally, the southwest shoulder of the mountain, which was right on the New York State border. 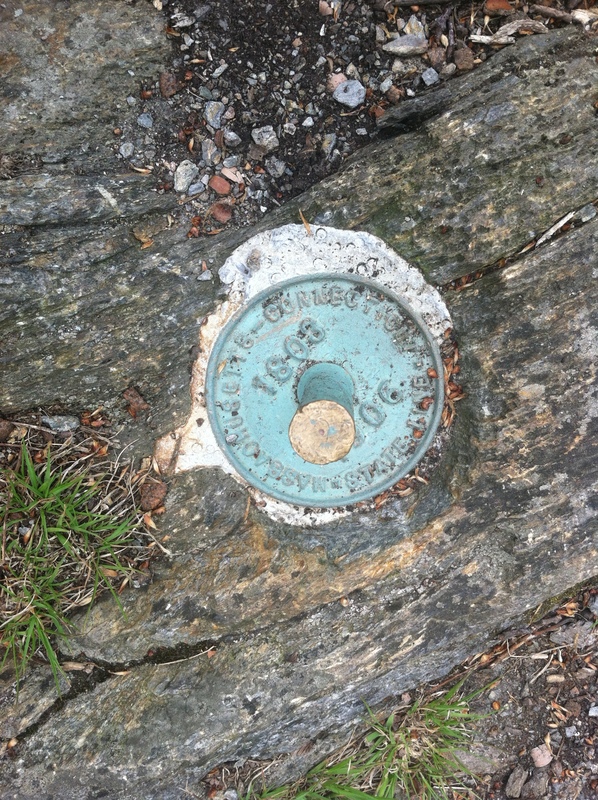 The location was marked with a stone pillar and a U.S. Geological Survey marker. After drinking in the views for a few minutes, we began the hike down the mountain. It was rugged at first, with lots of exposed, jagged rock, but it then became more like a mountain trail, and before we knew it, we were back at the junction of the unmaintained blue trail. From here, we would go approximately 3 miles south on the South Taconic Trail on our way to Brace Mountain, our next county high peak destination. The trail to Brace was almost exclusively a woods road, and was very manageable despite the moderate elevation gain. Although much of the route was shaded, we could feel the temperature beginning to rise, and knew we were going to be challenged to finish before conditions became unbearable. As we continued on, Bob made a remark to the affect of “I think I see your mountain there”, and indeed from perhaps 3/4 of a mile away, you could see a pole with a wind flag attached to it at the top of an obvious summit. “Yep, that’s it!” I exclaimed, excited to bag this next peak. We soon reached a trail junction with a detailed sign, which indicated the Brace Mountain summit was a mere 0.4 miles away. Another sign showed mileage in a different direction to both the tri-state border (of MA, NY and CT), and also to Mt Frissell, which is also the high point in the entire state of Connecticut. We would go to Frissell, but first we needed to get out to Brace. 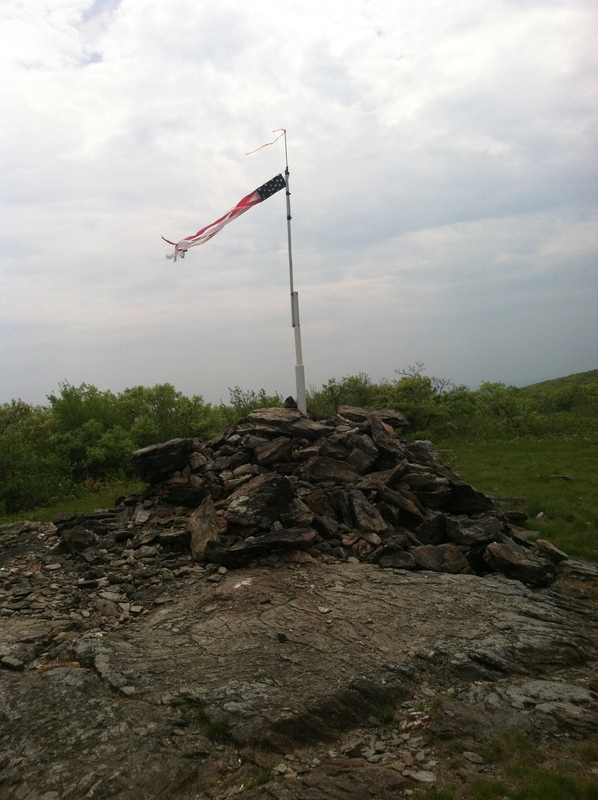 The Brace Mountain summit is clearly marked with a mound of busted up shale rocks, and also the aforementioned pole and flag. At 2,323 feet, this mountain stands as the highest point in Dutchess County. Just as it was with Alander, the views from here were splendid, with more of the Harlem Valley to our west (including lakes and farms), and the remainder of the South Taconic range to our south, which included South Brace Mountain. After taking a few pics here and a quick vanilla Clif Shot, we headed back north to the previous trail junction. 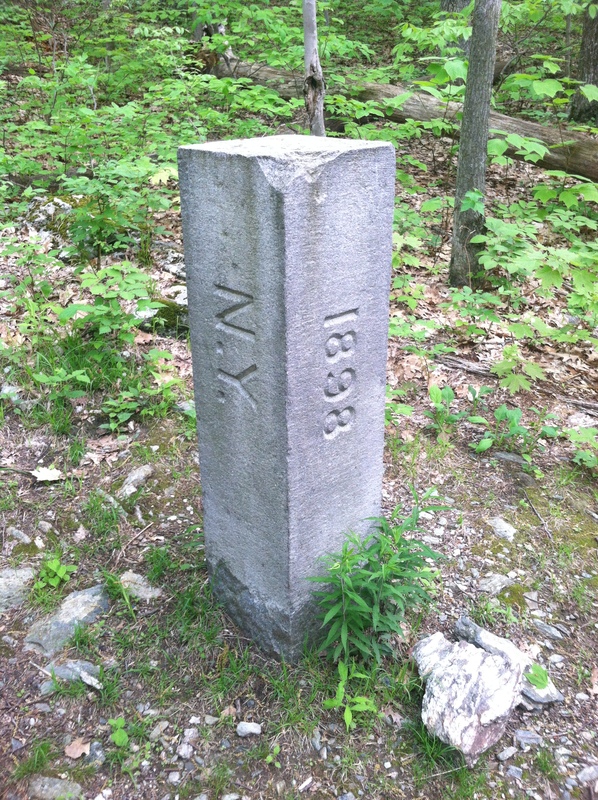 According to the sign, it was only 0.5 miles to the tri-state marker, and just 1 mile to the Connecticut high point on Mt Frissell. In no time, we reached the stone marker, and it was a unique experience to be able to take 2 or 3 steps in a given direction and say that you were in a different state. After some playfulness in that regard at the marker, we moved on toward Mt Frissell. And this is where the going got tough. It wasn’t especially noteworthy in the map topo, but the route to our final summit destination of the day was extremely steep, and even required some hand-over-fist effort. But with Bob’s knee arguing with him as we climbed, we finally made it there. 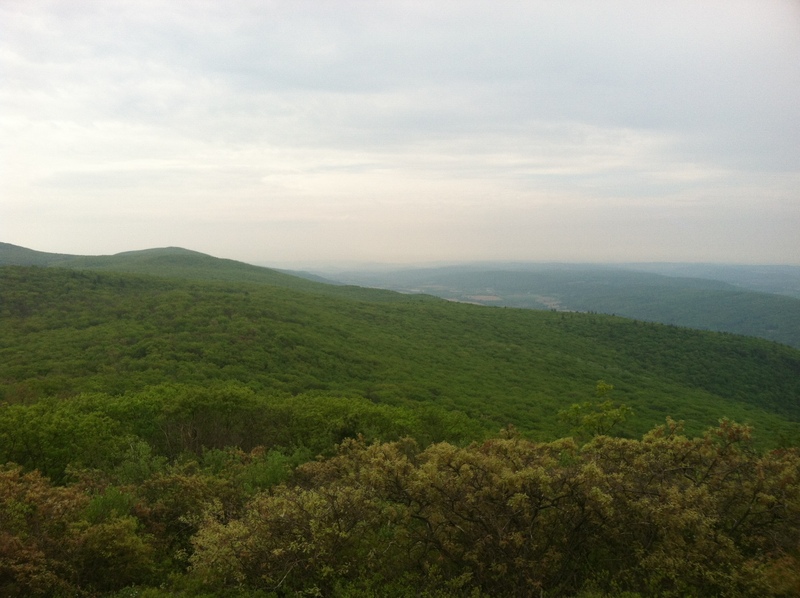 Although the view here was limited, it was marked with a Geological Survey disk, and there was also a military strong box that contained a hiker log book. 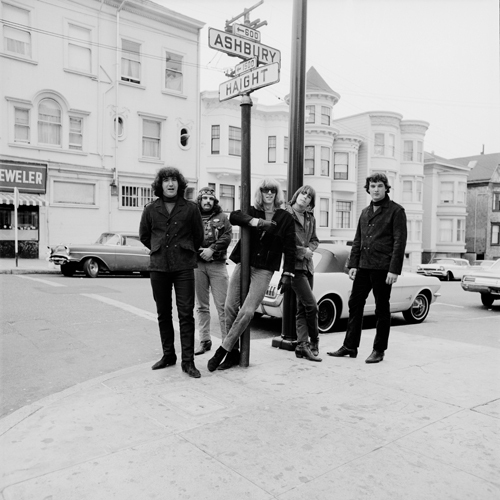 Bob pulled the book out of the box, and I signed us in. 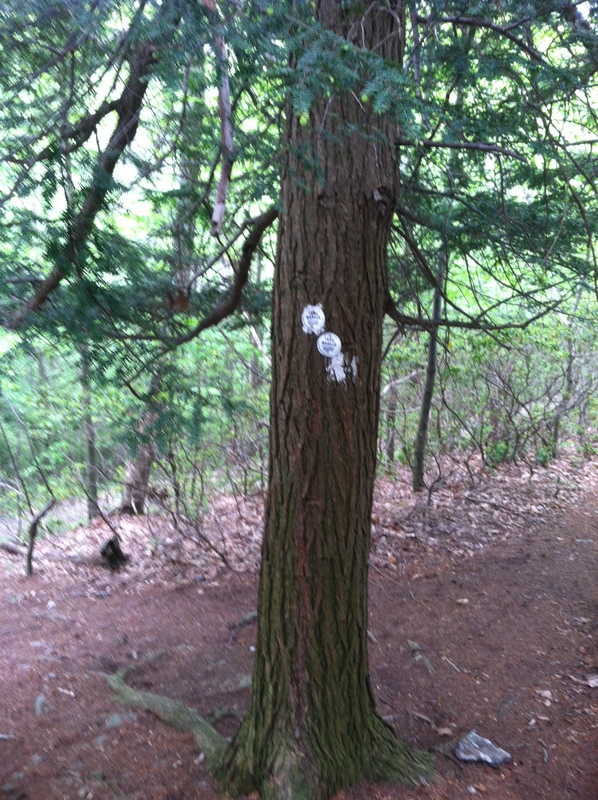 Looking at previous entries, it showed that hikers were visiting this locale about once or twice a day. After relishing our state high peak (only my 2nd ever, with New Jersey being the first), we began the 4.4-mile hike back to the car. Returning first to the previous trail junction, and then traversing the South Taconic Trail in the northbound direction, we eventually reached the junction of the Robert Brook Trail, where we had begun our day. Thinking that going down this last trail would be easy turned out to be a huge mental mistake on my part. This 900-foot descent, most of which was in the final mile, was excruciating on the quadriceps, and with each and every step, I found myself looking more and more forward to reaching the car. Bob and his temperamental knee were liking it even less than me, and it was an exercise in both patience and perseverance in making it back down the mountain. Having begun our trek at 8:45am, we finished at 2:05pm, for 5 hours and 20 minutes in total time. We could feel the heat now, and were glad to have the hike behind us before conditions got even worse. To celebrate our accomplishment, we would stop in Beacon at a place called The Hop, a trendy restaurant/bar with great food and craft beer. It was clearly a place for the hipsters, so we didn’t exactly fit in, but nobody seemed to mind the presence of a couple of middle-aged men reeking of trail residue. We enjoyed a sandwich and a beer or two while we further recovered from the day’s efforts. Two New York county high points (Columbia and Dutchess), one state high point (Connecticut), and one other mountain summit (Alander) were in our bag. Can wait for the next installment in this great adventure!